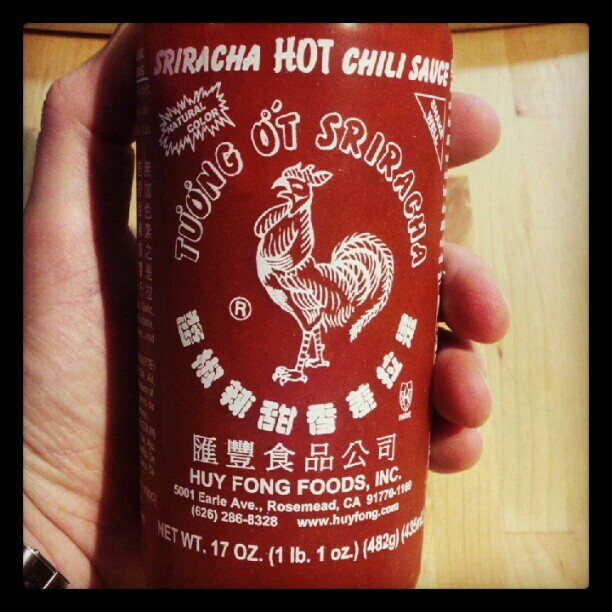 A few days ago I took a photo of my hand holding a bottle of Huy Fong Sriracha sauce (Rooster Sauce) using Instagram. I didn’t think much of the photo at the time, but since posting it, I’ve received a surprising amount of feedback. A few people commented on Instagram and on Facebook, but several other people have told me in person how much they love Sriracha. I have enjoyed the garlicky, vinegary hot chili sauce for years. I’ve used it as a condiment, as a major ingredient, and as a substitute for hot sauce. I’m not sure how large of a the cult following rooster sauce currently has, but we always welcome new members.